If you are ever in a car accident, it is important you understand how to handle the situation. Any auto accident, regardless of its severity, can have serious long-term financial and medical effects. There are certain steps you should take to ensure you have the evidence you need for filing a car accident claim and receiving compensation for the damages you have incurred. You can use these tips as a reference for what to do after a car accident. If you have any further questions or concerns about filing a claim, the experienced auto accident attorneys at The Edwards Law Firm will help you during a free, no-obligation consultation. Contact us today to get started. If you have been in a car accident in Oklahoma, you are required by law to stay at the scene. You could be charged with hit-and-run if you leave before law enforcement arrives, which can come with serious criminal penalties. Leaving the scene of an accident can also place serious implications on your level of fault and could jeopardize your chances of an insurer approving your claim for compensation. Take pictures of any property or vehicle damage and of the other parties involved. Note the conditions of the roads or weather before the accident. Observe the behavior of the other drivers involved and how they are responding to the accident. Check for any traffic cameras or witnesses who may be able to support your claim. It is required by state law that you check on all other drivers and passengers who were involved in the accident to determine their condition and if they are in need of medical attention. You should do your best to provide immediate assistance to any motorist, passenger or pedestrian who has suffered a minor or moderate injury and can be helped without causing further damage. However, if a person has suffered a critical condition, such as a neck, back or head injury, you will need to immediately call 9-1-1 and seek professional medical help. You should never touch or attempt to move a person who has suffered a critical injury after a car accident because any movement can worsen his or her condition. The only time you should move someone suffering from a critical injury is when he or she is in immediate danger and moving the individual will prevent further harm. Although you are required to check on the safety and well-being of other parties in a car accident, do not admit to any fault for causing the accident or their injuries. Even by simply apologizing for any of your actions during the car accident or to a person who has suffered an injury, you are accepting responsibility and may be considered liable for the car accident. It is often in your best interest to contact law enforcement after an accident, regardless of how minor it may be. However, if the accident has resulted in severe physical injury, death or property damage estimated to be more than $300, you are required to call the police. When the police officer arrives, obtain his name and badge number so that our attorneys will be able to contact him later and possibly use him as a witness or testify to support your claim. Police are also required to file a report when they respond to a car accident, especially if anyone suffered severe injuries or property damage. An accident report filed by the police is a valuable piece of evidence our attorneys can use when constructing a case on your behalf. 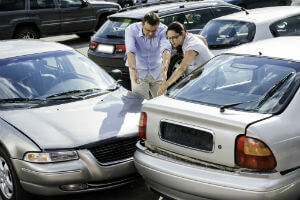 It provides an official stance on who may be liable for the accident and the events that occurred. After the responding law enforcement has documented your accident, you can request a traffic collision report from the Tulsa Police Department. This information will be crucial for our attorneys to identify who might have been at fault for your accident. If there were third-party witnesses to your accident, you should also collect their name and contact information. Our attorneys can also contact a witness to gain a more information about your car accident and the other drivers involved. This information can help prove that you were not at fault for the accident. You must immediately contact your insurance company to inform it about the car accident as soon as you are able. Since it is your own insurance company, recovering compensation will require your full and honest participation. This includes providing information about the extent of your injuries and the property damage you suffered. However, you cannot lie about or exaggerate any information you provide to your insurance company. You must explain the facts clearly and straightforward. An insurer may deny your claim if it finds out you have embellished your story or provided false information to an adjuster. Although car accidents are often overwhelming, following these steps may help you recover the compensation you deserve. If you were in a car accident, our experienced car accident attorneys can help you seek damages from the at-fault party. Do not hesitate to contact us to determine if you are able to file a claim. Our attorneys provide car accident victims quality legal services offered on a contingency fee basis, which means we require no payment unless we recover fair compensation for your claim.